A week from now would be Mahatma Gandhi's birth anniversary or what is termed in India as Gandhi Jayanti. In an earlier column I pointed out the TV survey of India's parliamentarians outside India's Parliament House where a fair number of Members of Parliament cutting across party lines were asked two questions. The first question was who wrote India's national song and the second question was to give the full name of Mahatma Gandhi. While not knowing the answer to the first question can be excused but not knowing the full name of Mahatma Gandhi was inexcusable especially when India's politicians invoke his name at every conceivable political meeting to burnish their own credentials of personal integrity. Further when demonstrating on political issues they tend to go and sit at the feet of Mahatma Gandhi's giant statue in the precincts of the Parliament House which shows him sitting in his characteristic sitting pose in prayer meetings. Recall the face of the poorest and the weakest man whom you may have seen and ask yourself, if the step you contemplate is going to be of any use to him. Will he gain anything by it? Will it restore him to a control over his own life and destiny? In other words, will it lead to Swaraj for the hungry and spiritually to starving millions? Then you will find your doubts and your self melting away. For the benefit of India's politicians it needs to be repeated that Mahatma Gandhi's full name was Mohandas Karamchand Gandhi and he was born at Porbandar in Gujarat on October 2nd 1869. His death took place by assassination on January 30th, 1948 at New Delhi. A little less than sixty years after his death India's politicians including the Congress Party which claims his heritage have forgotten his values and he seems to have been consigned to the mist of history. Sadly Bapu, India's politicians of all creeds do not seem to be listening to you. What to talk of listening to you they have even forgotten your name and identity despite their annual ritualistic pilgrimage to Rajghat. 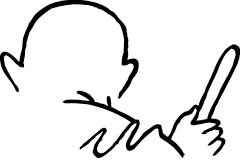 In my humble opinion, the four most sterling qualities that Mahatma Gandhi stood for and strived for in India's freedom struggle which he so nobly led were Truth, Integrity, Moral Standards and Self-discipline. These should have formed the bedrock of India's political culture and the guiding ethos of India's politicians. Regrettably, as one surveys India's political landscape and the behavior of India's politicians both inside and outside the Parliament House, the picture is so dismal that even Mahatma Gandhi would turn in his 'Samadhi' at Rajghat. The flock of tainted Ministers and Members of Parliament with criminal backgrounds who adorn the benches in the Parliament are a sad commentary on the depths to which Mahatma Gandhi's cherished values of Truth, Integrity and Moral Standards have fallen within India's polity. It is a telling commentary also on the senior leaders of all political parties who give tickets to such politicians to enter Parliament or who defend tainted Ministers on grounds of narrow technicalities rather than following Gandhi's high standards of political probity. As far as Self-discipline is concerned the word no longer exists in the dictionary or vocabulary of India's politicians. If it did then one would not witness the sorry spectacle of free style wrestling matches or Thai boxing that lately takes place in Parliament besides the unrestrained use of abusive language. Mahatma Gandhi's Spartan lifestyles in political life have given way to Mughal Empire lavishness if one was to judge it by their daily lives and the regal splendor displayed at the weddings of their off-spring. Where does the money come from? It has been said by many that Mahatma Gandhi 'instinctively felt the heartbeat of the nation'. Can the same be said today of any of India's political leaders? They live in ivory towers fenced in by high barbed wire fences from their own people. One wonders whether Mahatma Gandhi would have approved all of this had he been alive? India's political leaders and politicians have lost and forgotten Mahatma Gandhi. But had not they done it in his lifetime when he chose to be away distant from New Delhi and its 'Tryst With Destiny'! So on the coming October 2nd when India's political leaders and politicians come to pay homage to you at Rajghat, whisper to them Dear Bapu that you do not need their flowers and folded hands but that that they should go and transform themselves to be worthy of the India that they claim to lead.